Uefa general secretary Gianni Infantino entered the Fifa presidential race hours before Monday's deadline. 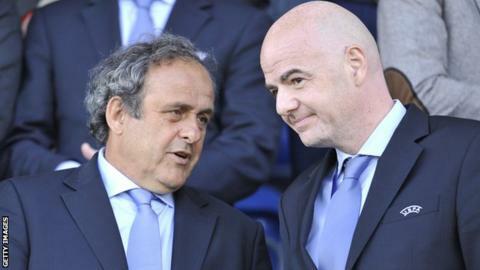 Infantino joined suspended Uefa boss Michel Platini in the bid to replace outgoing president Sepp Blatter, 79. Asian Football Confederation president Sheikh Salman bin Ebrahim Al Khalifa also confirmed his candidacy. The deadline passed at 23:00 GMT on Monday, with nine candidates thought to be in the running, although Fifa has yet to confirm the shortlist. All candidates had to obtain the written backing of five football associations under Fifa electoral rules, with Blatter - who like Platini is also banned - to be succeeded at an election on 26 February. Infantino, who joined Uefa in 2000 and has been general secretary since 2009, joined the shortlist on Monday. "I will in due course be setting out my detailed thinking in a manifesto which will address the challenges and opportunities ahead," said the 45-year-old Swiss. "It will be based on the need for ‎reform and also for a Fifa that genuinely serves the interests of all 209 national associations, big or small, and that puts football and football development at the top of its agenda. "If elected I would lead that change in partnership with all who want to see a Fifa worthy of governing the world's number one sport with dignity and respect." The AFC website reported on Monday that Salman told the 47 AFC member associations his campaign will be entirely self-financed, and that he will not use the AFC's resources, human or otherwise, in the election. Platini maintains he will stand despite Fifa saying it cannot recognise its vice-president's candidacy while his 90-day ban is in place. To date, South Africa's Tokyo Sexwale, Prince Ali Bin al-Hussein of Jordan, former Trinidad and Tobago international David Nakhid, former Fifa deputy general secretary Jerome Champagne and Liberia FA president Musa Bility have said they have formally submitted their bids. Fifa has confirmed it will hold the election to determine Blatter's successor at a special congress on 26 February, 2016. Swiss Blatter and Frenchman Platini, 60, are suspended while Fifa investigates reports that a £1.35m payment was made in 2011 for work Platini did as Blatter's adviser.